Ready to be cooked once. These polpette, or meatballs, fit into the category of slow food, since they take a long time to cook. But the pay off is in the fully-developed flavours, especially of the caramelized onions and fennel. I’ve called them ‘biscotte’ (twice cooked) as a bit of a joke, since you cook them first on their own and then in the tomato sauce. You could of course, make them in three different phases. Firstly, the meatballs, secondly the sauce, and finally cook them together. Alternatively, you could make the sauce while the meatballs are in the oven or even at the same time. The possibilities are endless! Once more unto the oven, dear friends, once more! In Venice polpette are often served as cicheti. However, they make a really nice autumn dinner or Sunday lunch. I serve them with sautéed potatoes but you could serve them perhaps with rice. Just, not with spaghetti, OK? Melt the butter in a frying pan over a low heat. Add the onion, fennel, and salt with a little water and cook on low until caramelized, about 1 hour. You may need to add a little more water every ten minutes or so. In a large bowl mix the onions and fennel with the pork, beef, salt, eggs, and cheese. Make the mixture into ball shapes with your hands. Place the balls on a lightly greased baking tray and then place them in the oven for 30 minutes. Fry the onion gently, sprinkled with the salt, in a little oil until translucent, about 10 minutes. Add the tomatoes, wine, and sugar. Cover and simmer for 30 minutes. Remove the lid and cook for a further ten minutes to reduce slightly. Place the meatballs in a large, oven-proof dish. Cover them with the tomato sauce. 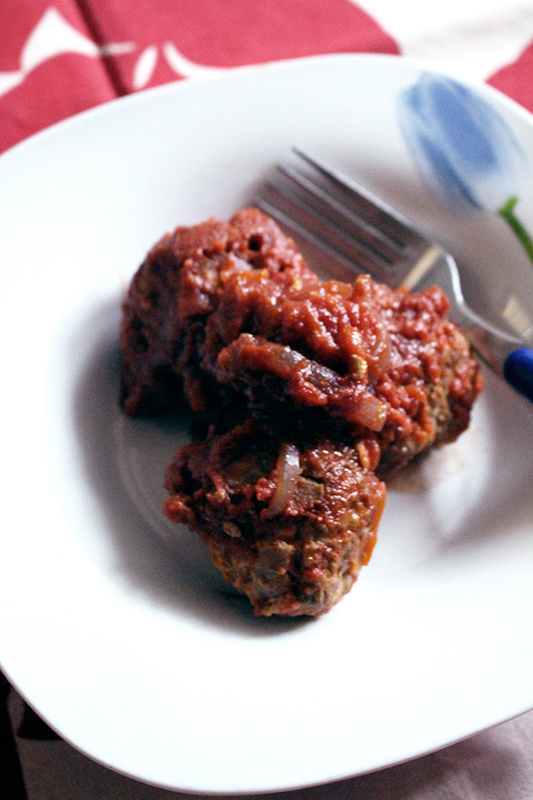 this recipe: it results in a firmer and more meaty ball. The aroma of the caramilzed fennel and onion was just the start. Adding the cheese into the meatballs helped as a binding agent and when they came out of the oven each little ball was slightly oozing a wee bit of cheese. So delicious! Easy to make. We were treated to these last evening by friend Edie (see her comment) after I shared the recipe with her. They were so flavourful and the caramelized onions gave such a subtle sweetness that was so delicious. I also love your recipe for Carbonara, I WOULD NEVER add cream as so many think is the “proper way” Blasphemy! Keep up the great work!